Earlier this summer I subscribed to a new magazine. A cooking magazine of course. Louisiana Cookin’. While it is not a new magazine I just found out about it. When the October 2012 issue arrived I scanned through it and was immediately drawn to a brownie recipe. No ordinary recipe. 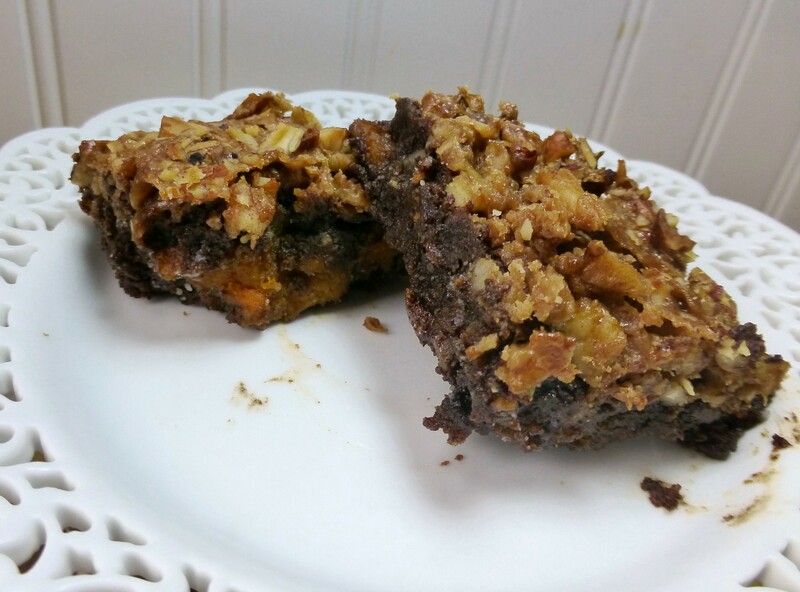 The brownies were one of the winners of the magazine’s annual Sweet Rewards Recipe Contest. 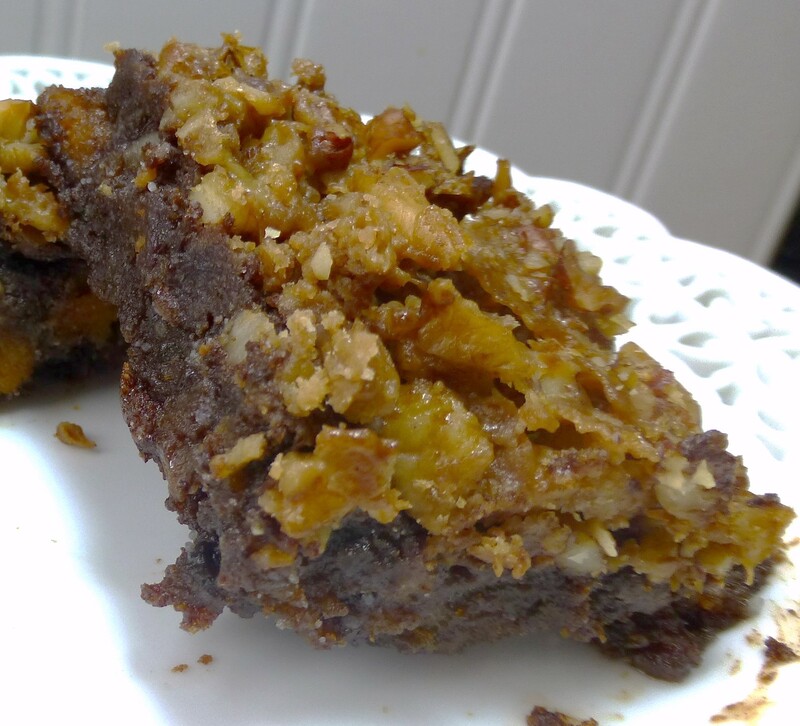 And it wasn’t really the sweet potatoes in the brownies that caught my eye, it was the topping – Pecan Praline. WOWZA!! How could I pass that up? Prick sweet potato allover with a fork. Wrap in a wet paper towel, and microwave on high heat for 5 minutes. Continue to microwave in 2-minute intervals until soft. Set aside to cool. Once potato is cool, peel, mash, and reserve pulp. Preheat oven to 350°. Lightly grease an 8-inch square baking pan. sugar. Using the paddle attachment, beat at medium speed until combined. In a heavy saucepan, melt 1/2 cup butter over medium heat. And brown sugar and salt, and bring to a boil. Cook for 2 minutes, stirring constantly. Remove from heat, and slowly whisk in evaporated milk. Return saucepan to stove and bring mixture to a boil again. Boil, stirring constantly, until mixture reaches 230° on a candy thermometer (soft ball stage). Remove from heat, and stir for 2 minutes; let cool to lukewarm. Add remaining 1 teaspoon vanilla and confectioners’ sugar. Stir until combined. Pour mixture over warm brownies, and top with remaining 1 cup pecans. I made these exactly as the recipe listed except I made up my own evaporated milk. I don’t know if that was a good idea or not. The brownies NEVER got solid enough to slice. I had to chill them before I could slice them and even then they could only be eaten with a fork. I have no idea why this happened. These were so completely delicious. You could not really taste the sweet potato in the brownies. Or at least I couldn’t. But THAT TOPPING!! O My Word!! I might use the topping on my favorite brownies. And maybe add in the sweet potatoes. Would have never guessed there was potato in these! They look delicious! I’d eat the topping. LOL…this is truly original and unique in my book, so it is just a lot of fun to read about it, see it, and learn how it all goes together. I will trust you on taste…that topping looks dangerous, I would have eaten it before it ever capped the brownies. You with a new cooking magazine, this is going to be fun! Wow.. I can see why this recipe was just begging to get made and devoured! I love the sweet potato ingredient.. and you’re right, that topping!! Amazing! oH, YES!! FUn and very very dangerous. Already have 5 recipes marked!! You had me at Sweet Potato Praline. So, if you’re doing Magazine Mondays, what happened to Malgieri Mondays? The nice thing about Magazine Mondays is that I can post any time. Submit and she posts on Mondays. I am still doing Malgieri Mondays!! oh yum! those sound so amazing!! !